Why does your organization need Contingency Plan? A multitude of laws and regulations specify or imply requirements for Business Continuity Plan (BCP) and Disaster Recovery Planning (DRP). These requirements vary among industry sectors, affecting the development, focus, and execution of business continuity plans. As per research document published by Gartner in July 2005, Gartner analysts looked at four industry sectors — healthcare, government, finance, and utilities— to determine which laws and regulations most influenced BCP/DRP in these sectors. Our Contingency Plan templates can help you to comply with regulations and standards like JCAHO, FDA, Sarbanes-Oxley (SOX), FISMA, COOP & COG, FFIEC, Basel II, NIST and ISO 27002. Contingency Planning means the overall process of developing an approved set of arrangements and procedures to ensure your business can respond to a disaster and resume its critical business functions within a required time frame objective. The primary objective is to reduce the level of risk and cost to you and the impact on your staff, customers, and suppliers. 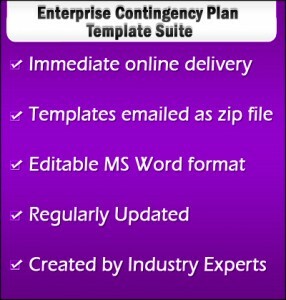 Who can use this Contingency Plan Templates Suite? These templates can be used by IT departments of different companies, security consulting companies, manufacturing company, servicing companies, financial institutions, educational organizations, law firms, pharmaceuticals & biotechnology companies, telecommunication companies and others. Any organization large or small can use these templates. Contingency Plan template suite for an enterprise can be used for Business Impact Analysis (BIA), Risk Assessment, Disaster Recovery Planning (DRP) & Business Continuity Plan (BCP) and Testing & Revision of Plan by any organization. These templates can also help you to meet the requirements of Sarbanes-Oxley (SOX), FISMA, ISO 27002 or any other regulation/standards requiring BCP & DRP. Any organization, large or small, can use this template and adapt to their environment. These templates are available in Microsoft Word and Microsoft Excel formats, which allows easy changes to the document. Our templates can jump start your Contingency Plan project and save you lot of time of your team and money. Contingency Plan templates suite has more than 100 documents that have been customized to help you meet requirements. Our template Suite can help you save time and money if you are utilizing your staff to complete the project or using contractors. The following table clearly shows how much time and money you will save by using our templates and sample documents. The entire series may be purchased as a suite, or templates may be bought for different projects like BIA, BCP & DRP – whichever approach works best for your organization. However, given the interrelationship of many of the templates, they will be of greatest value to users if the suite as a whole is obtained.